You have to see this video. It's incredible. Korean television has footage of a woman, unarmed, with nothing more than her voice and her unarmed body as she tries to stop two Israeli soldiers from firing on Palestinian protesters. Turn up the sound and listen to what she says. Even if the Israeli soldiers were firing rubber bullets -- at point blank range (and even over longer distances) those shots would be fatal. And yet she sticks out her hands to block the muzzles of the guns and keeps talking to the soldiers to tell them to stand down. 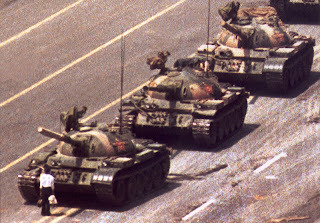 It's the man with the groceries standing up to the Chinese tanks motoring towards Tiananmen Square all over again. I'm always very divided about issues surrounding Israel. I think many Americans on the right have a knee-jerk support of Israel (either for strategic reasons, or because they're evangelicals who believe Israel will bring about the Second Coming, and who then believe that 2/3 of the world's Jews will be killed in the Rapture because they haven't embraced Christianity - funny, but I don't call that "support"), while many on the left have a knee-jerk support of the Palestinians as the "underdog," without recognizing that Israel and Jews have just as much a right to that claim. I've seen it three times now and wept every time. The young woman is being identified by my facebook friends as Huwaida Arraf, a Detroiter married to Adam Shapiro, a University of Michigan Poli Sci graduate, and a founder of International Solidarity Movement, a nonviolent activist organization. A commentator on Americablog points out that this young woman's actions are similar to those of Rachel Corrie -- who lost her life trying to block a bulldozer from leveling a Palestinian home in the Gaza strip. Astounding! Policy and politics live in a world of self important impotence in moments like this. One human confronting another human. Each following her/his righteous call. Each deserving of and offering the respect due the other. My heart raced. I wept. Yes the humanity of it all is just incredible. Perhaps Huwaida's greatest gift was to affirm the humanity of the Israeli soldiers while also reminding them of the humanity of those they were firing upon. How she kept her cool during that whole exchange is incredible. It's interesting to note that she is the only woman in the whole scene. Basically there were teenage male Palestinian rock throwers facing off against male Israeli just-older-than-teenage soldiers -- and the one woman on the scene is the only person working to de-escalate the situation (with remarkable success I might add).